Why won't the second piece of roof, or step, from bottom going up, anchor? The anchor tool won't show a yellow light on this step so I can anchor it. P. S. I know the top of the roof is not anchored; a second popup is going to be behind this one. Ignore above please. I still don't know why the anchor tool wouldn't work but I was able to bring in a rectangle and put it where it needs to be, and it anchored. Thanks @Crazy_Mr_Zing. I did draw the lines in PCS with the draw function and one of them was crooked somehow and I did crop it. Another interesting lesson. Was able to fix the green arrows and then anchor the red arrows manually. After all that my plan didn't work. Making double popups successfully is HARD! 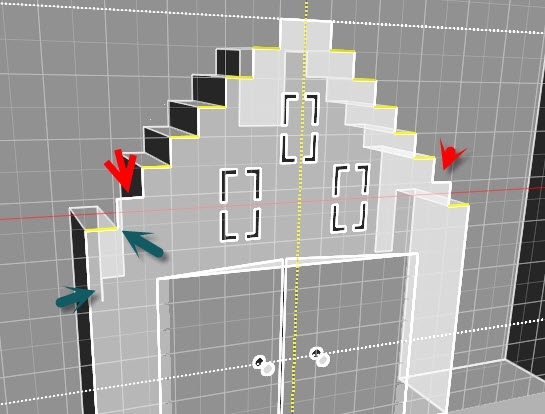 Especially when using arches or steps like this. I always forgot the length needed to make such designs pop out. Besides that I still can't cut. Waiting for Ron to get back to me. Thanks so much for your help. I love reading just about everything you post and did I remember to tell you your Tea House is gorgeous? sort that pushes that bit and that bit pushes then next. rather a long dirversion form a popup card ???? ?